Using "=" vs "<=" in M2000. Like in Basic, in M2000 we can declare a variable by assigning a value to a name. We use $ as last char for strings always. We use % as last char for integers, but integers in M2000 are double with no decimals. A statement A%=5.5 assign value 6. 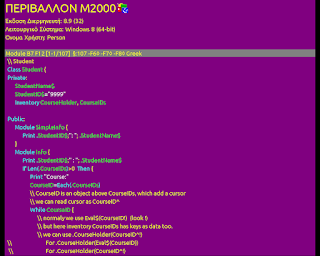 All computations in M2000work on a double accumulator. Strings can store very large content (16bit, UTF16LE) and are BSTR (used in COM objects). Lets say that we make a module Alpha and in the code of Alpha we have A=100. Now a Alfa.A created. Every time, after local declaration, interpreter find local A and not A (from manual declaration). This is shadowing operation. A global variable has no hidden part, or module name, or function name, as part of the final name (lika Alpha.A for A in Alpha module). If we wish to change value to global variable we have to use <=. When we use it, interpreter use name as is and search for it (using a hash function). If can't find then an error produced, because this "<=" is only for assigning a new value, not declaring a new variable. Supposed that we make this group in Module Alpha. After declaration there are three variables: An Alpha.Example.X, an Alpha.Example.Y and Alpha.Example. The last variable is the object with a list of members. Each variable and member of Example group is local variable for Alpha. See X and Y get initial values in Group declaration using "=". In Module Change, .X (dot ex) which is Group member need a dot and <= to change value. If we place a X=1000 then that X became a Change.X as a local X in Charge. When we wish to change Y outside Example we use a simple "=". Groups passed by value or by reference. By referencc the member list used to define menbers and a new list for these members, and for each member's name there is a pointer to point to original value. So when we altert a "referenced" value, actually we altered the original value. This not hold for "referenced" member list. We expand list, expand the referenced group, without altering the original member list. By value we simple make a new group, with no name. When a Read statement, with a simple name, find in stack an anonymous group then make a new group using that simple name. Calling a module passing by value a group is the same as we Push a group in stack. Here we make a group from a class function, a constructor for a group (here using default constructor). With List command we can see the names of all variables. (with Module ? we can see the names of all modules/functions). Private members arn't displayed. If we use Read Beta in module Look in Delta, then because Beta is a global name, we get the a copy from group in stack, so X became 10. Using Read New we tell to Interpreter that Beta is a new name, so a new Beta (as Delta.Look.Beta) declared. Module's name is Delta.Look. Beta.X and Beta2.X because are made by aunamed groups (class return such a group) have no other parts, so when we wish to assign a value we have to use <= like these examples: Beta.X<=400 and Beta2.X<=400. But Group Beta3 has Beta3.X as Delta.Look.Beta3.X so need a simple =, so a Beta3.X=400 is ok. If we change variables with properties then the same hold: If we declare a group from an anonymous group, and the name of that group is the same with a global one, then we write on the global one, except we use READ NEW. \\ all data members are like globals. We have one class, with two lists, a list of students and a list of history. 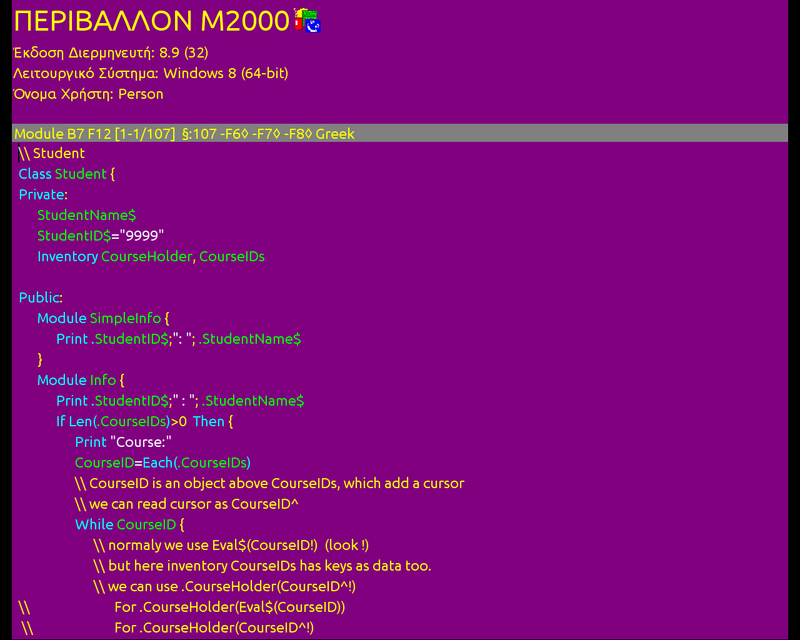 We have one class as factory for making students groups of data/code (objects in M2000). We can add students, we can get a student and alter credits and put back again, we can move a student to another list, we can rename student (adding a title perhaps). \\ but we can set a pointer to other variable. 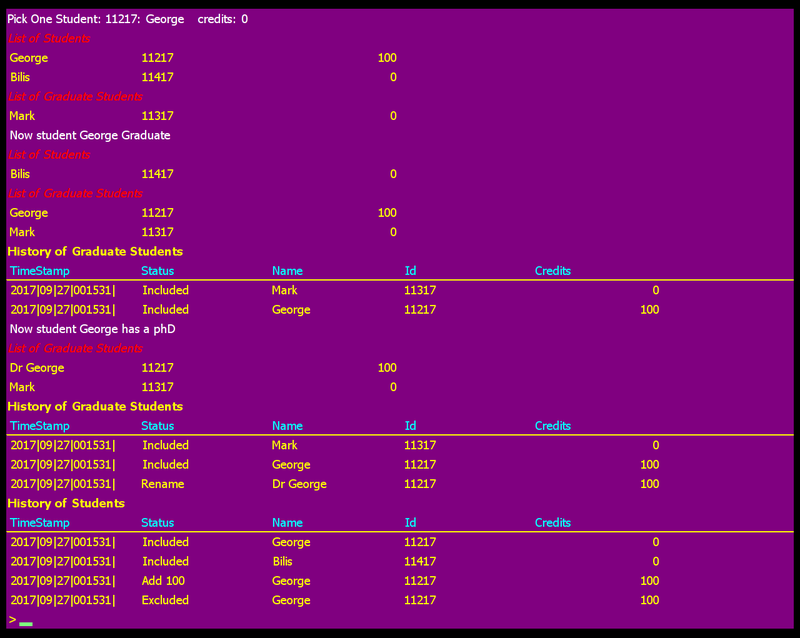 \\ Here we use Inventories as pointer holders, which map to keys (here the id of student). \\ Groups can be copied, and can be merged to other groups. \\ Properties are Groups with set and value. or set, or value part. So a readonly Property has only value. \\ For each property there is a private field, for name$ is [name]$, so we can write from inside code in group. If trim$(name$) ="" then Error "No name found"
\\ but in constructor we get a reference to other Inventory. \\ also need to exist a Student Class. If Trim$(newName$)="" Then Error "Please place a name"
} else Error "Id not exist"
\\ name$ is a property. All properties are public. We can define If a property return value, or take value, or do either. 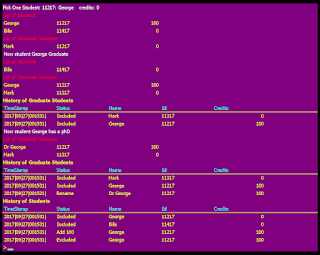 graduateStudents.RenameStudent "11217" , "Dr George"
M2000 has two kind of objects when we think about pointers. An Inventory is an object, a list of keys, or keys and data (pairs). This kind of object is a reference type always. We can make as many variables, or array items, or inventory items, or stack items to point to one Inventory. Another type of object is the Group Object. This object has only one pointer to hold it, and is internal, and not exposed to user. So we can hold in one place only. There is one type of reference, a reference by name, or Weak reference. We can pass a Group in a module using a reference to "current" name of group. We use & before name and actually we pass a string with full name of Group (we see in source always a name which is a small part of current name, Interpreter expand names, and use expansion for scoping purposes). A module get parent stack, and is responsible to leave stack cleaned from passing values. A function get a new stack and can leave anything, because stack destroyed after function call. In Class function we have a constructor as a Module but this is called when we use class name as function, so module receive stack from function, so we can leave parameters and at return from function these erased. Because we can use constructor (if we place it before Class: label), as a module call, then we have to do something with garbages..on stack. So Constructor normally exist after a Class: label, which Interpreter use as they are internal in Group, but not exported by class function. (Class function make a closed group, and then no class: type data and modules/functions can be copied). \\ and module take two. If .Name$="" then Error "Undefined name for Course"
If Len(.ID$)<4 Then Error "Course's ID need at least 4 digits"
If not .ID$ ~ "[1-9]"+String$("[0-9]", Len(.ID$)-1) then Error "Invalid chars for Course's ID"
In M2000 the statement A=(1,2,3) make an array with 3 items and link to A. A statement Link A to A() give to A() a link to A so we can use Print A(1) to get 2. A statement: Dim B() and another: B()=A() get a copy of A() to B(), so if at the left hand of assignment we have this kind of array A() we get a copy. So A is a pointer to array, B() is an array and we can export a pointer: A=B(). Also we can copy new values B()=((1,2),(3,4)), and we get Print B(0)(0)=1 , but we have to Dim B() first or make a Link to B(). So now lets drop arrays and do a work with Inventory. An Inventory can hold keys, or keys and data. There are two kinds. The normal one, where key can be feed as numeric or as string (but is string internal), and must be unique. The other one is the Inventory Queue, a special one, when we can but same keys, but always we get last one (except we take all keys with an iteration process). This kind of inventory can't delete any key, but only "drop" from the end of list (where we put the last keys). This kind of inventory ha same functionality (but isn't the same) as M2000 interpreter's list for variables. \\ but here inventory CourseIDs has keys as data too. As we can see we get a double linked objects, from arrays of objects (Garbage collection is automatic in M2000), without use of a "second" reference to any object of type Group. Garbage collector works only for objects like Arrays, Inventories and Stacks. What type of Language M2000 is?